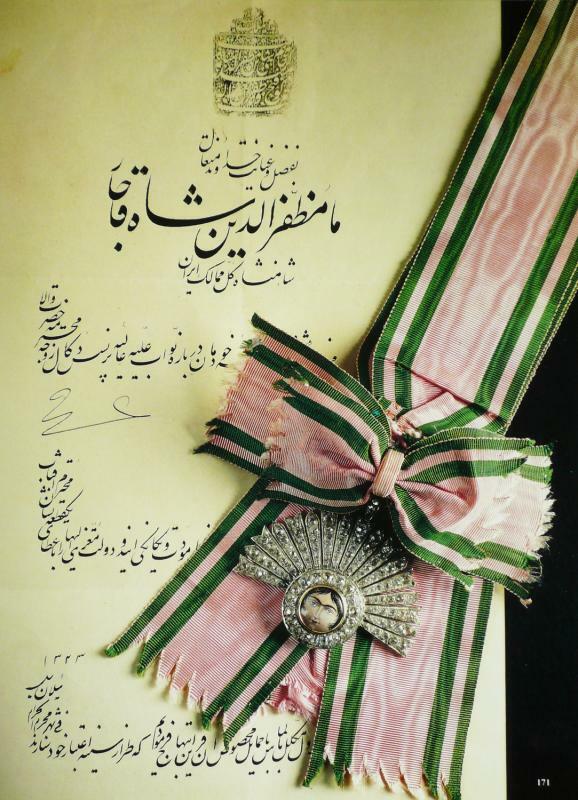 Queen Mary's Aftab order sash badge with diamonds, bestowed by Persia in 1904. From the book Royal Insignia, British And Foreign Orders Of Chivalry From The Royal Collection by Stephen Patterson. "in December 1952' Queen Mary's Private Secretary Major John Wickman wrote to the Librarian at Windsor Castle, Sir Owen Moreshead, that the Queen " well remembers the occasion before her departure with Kng George V to India in 1904 when the Shah personally invested her with an Order all blazing with diamonds which looked rather like a rising sun." 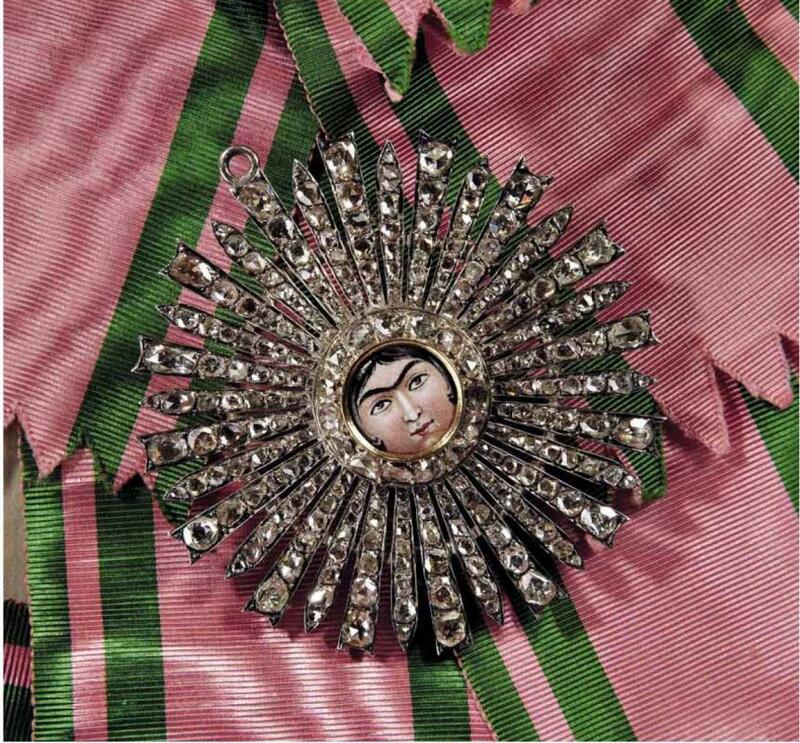 Queen Mary's Aftab order sash badge with diamonds, bestowed by Persia in 1904 close up. 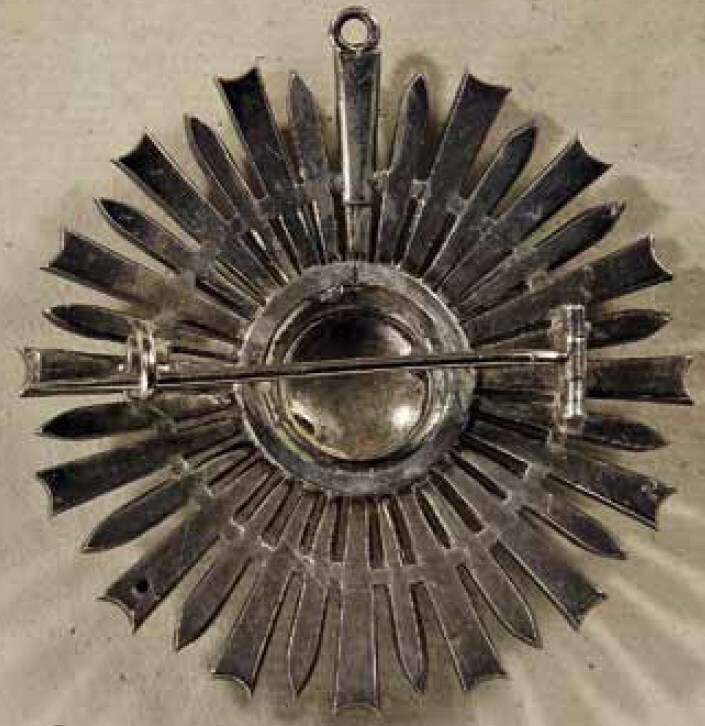 From the book Royal Insignia, British And Foreign Orders Of Chivalry From The Royal Collection by Stephen Patterson. 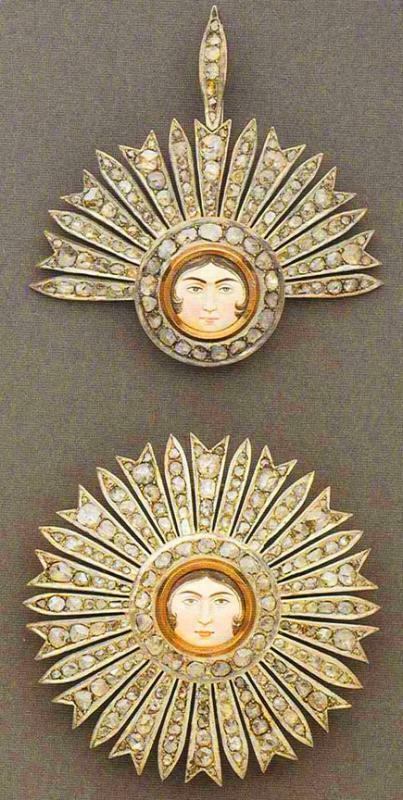 "The badge and star given to Queen Alexandra, which was depicted wearing during the Shah's visit in 1902, differ from those presented to Queen Mary in that there was only a semicircular star with pendant diamonds rather than a circular star and the badge is of diamonds and enamel rather than of just diamonds." From the book Royal Insignia, British And Foreign Orders Of Chivalry From The Royal Collection by Stephen Patterson. 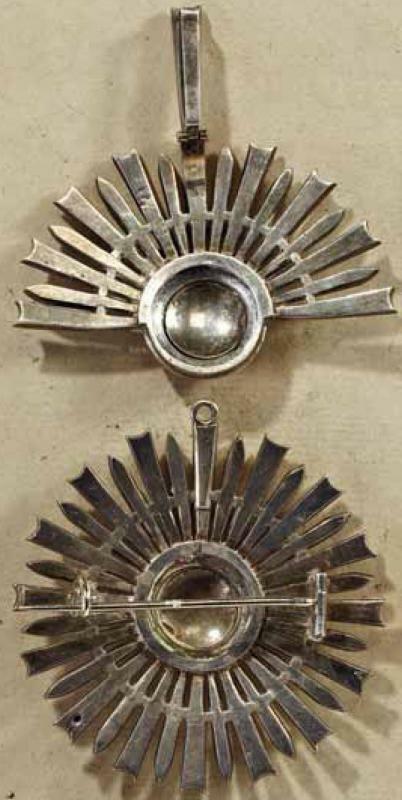 An order of Aftab set with semi-circular and full circular breast star. Image courtesy of Babar. This set was auctioned off in a Morton and Eden auction. 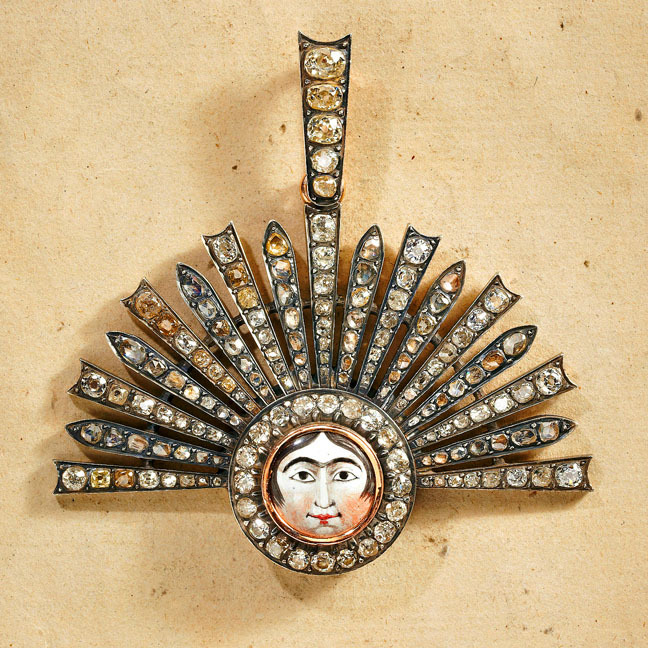 "[ Orders Decorations Medals ] Qajar, Order of Sun (Nishan-i Aftab), set of insignia, of European manufacture (probably French), late 19th century, in silver with gold and enamel centre, comprising semi- circular sash badge and circular breast star, the central enamelled female face with a circle of diamonds around, the rays of the badge and the star and the suspension of the badge all set with diamonds of varying size, the badge 70 x 60mm, star 70mm, contained in a Samiomamalek of Teheran red leather case, extremely fine and very rare . Estimate 6000-8000 Pounds. Ex Bonham's Islamic Works of Art Auction, 29 April 1998 lot 230. 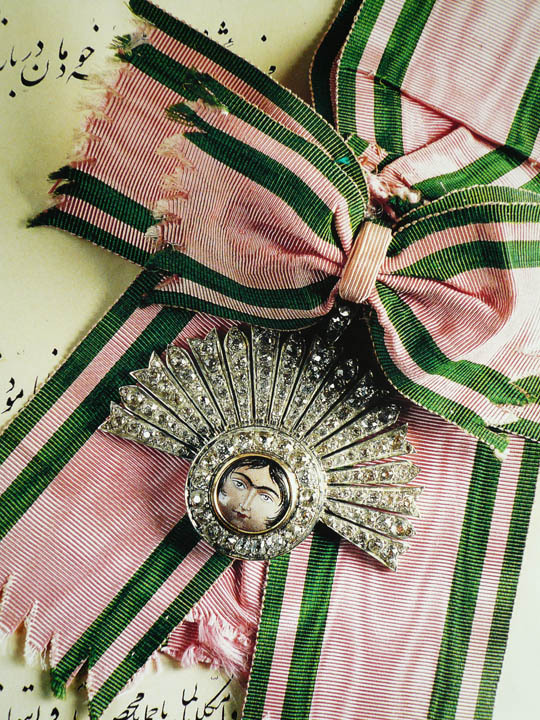 The set is also featured in Qajar Portraits, Julian Raby, Azimuth editions, London 1999, figure 108 THE ORDER OF THE SUN was founded by Nasir-al-Din Shah during his first European Visit in 1873 and was originally awarded solely to queens regnant. 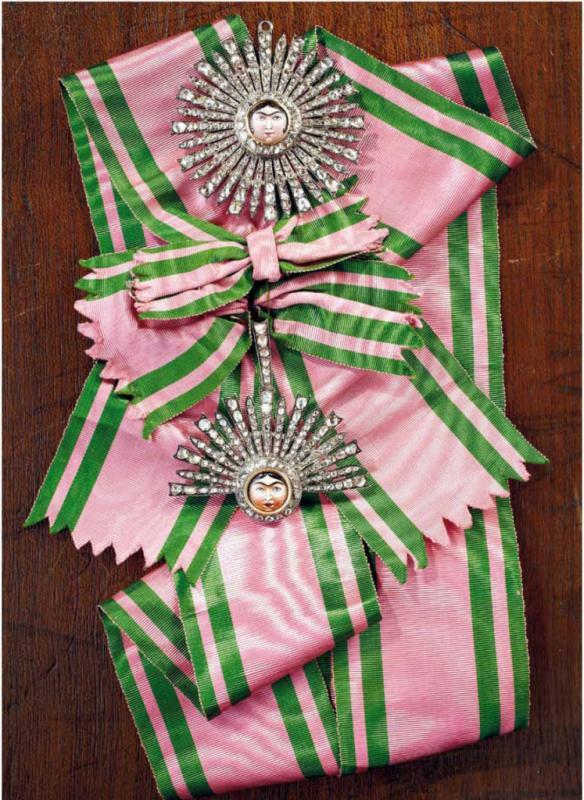 The badge was worn on a pink riband with two narrow green stripes either side. Queen Victoria was one of the first recipients and the Order was later bestowed on Queen Alexandra in 1902 and the future Queen Mary in 1904. The badge from the latter is in the Royal Collection and was on display in the Windsor Castle exhibition of 1997. 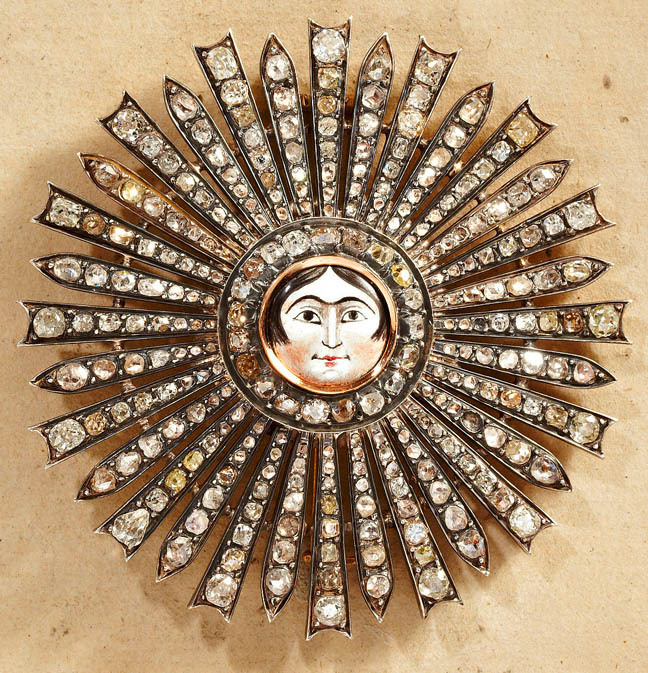 By the early 20th century it was extended to the wives of senior diplomats (compare the set awarded to Sabina Maissa, wife of Felice Maissa, Italian ambassador to Teheran from 1901-04, Sotheby's Geneva, 17 November 1994 lot 88, and the star awarded to Lady Lucia Marling, wife of Sir Charles Marling, British ambassador to Teheran during the Great War, Christie's, 2 October 1991, lot 189)." Dear Markus, thank you for this gorgeous scans! The problem is the first one shows the Order with a firman issued NOT for Victoria: it is dated 1323, i.e.1905. So the paper (and the badge shown?) are not of Victoria but of Princess (future Queen) Mary - they say (in Wiki) she recieved her Aftab on June 16, 1905. Do we know who was the holder of the star and badge on Babar's image? Dear Markus, one more question - if this image of the Aftab with sash over firman really signed in the book as Victoria's? If yes - then it's a kind of mistake (?). I've asked one of my friends to help us and to read day-month on this firnan - but there are none, he says:( Just the year 1323. I wonder if this is all a mistake and that Queen Alexandra is actually wearing the ywo decorations in reverse? 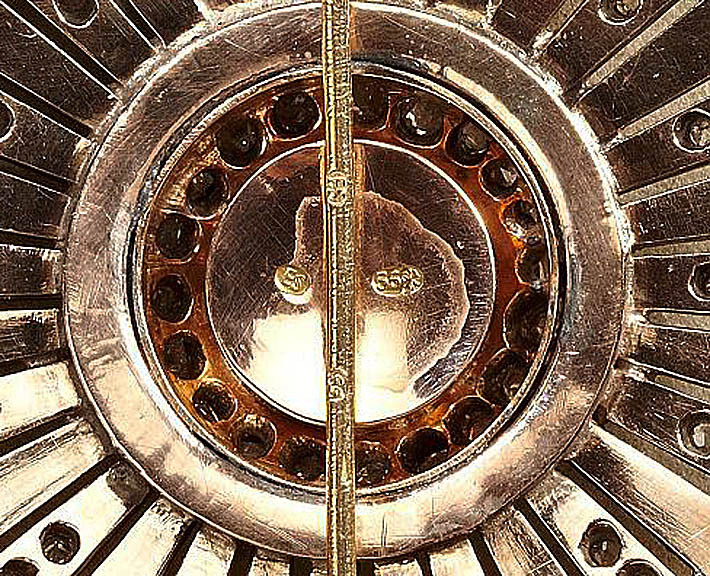 Perhaps the semi-circular decoration is actually the badge and should be worn from the broad riband. It looks exactly like the sash badges presented to other recipients, except for the additional drop diamonds. When presented, it may have been in the box alongside the other insignia, but not actually attached to the riband. Conversely, the 'special' diamond and enamel 'star' may have been pinned onto the bow of the riband by mistake. It is possible that because the star came with its own bow, the Queen was not quite sure where to pin it on. Clearly, with all its sharp points and raised surface it could not have been meant to be worn at the hip. As I mentioned earlier, there was an older Turkish order with a star which ladies wore from a ribbon on the breast. But this too would not have been familiar to Europeans because it was never bestowed on foreigners. I like your first theory James! These orders probably did not come with instructions and no one wanted to correct the Queen and have her lose face or embarrass her. It seems that since this was a photo session staged with the Shah, that she would have worn all of her Aftab order medals. From what I have read about her she always had a problem with punctuality. So perhaps it was a very simple mistake. The photographer and everybody was waiting. She rushed out having pinned everything on as best she could in the time. As far as I can see from the much earlier Queen Victoria photograph and the Queen Elena portrait, the sash is also over the wrong shoulder and should be left to right, not right to left. This too suggests a late addition of the Aftab insignia. She probably came in with the VA and RF orders already pinned onto the left shoulder and there was no time to re-arrange everything at the last moment. Seems Andreas Thies' latest auction catalog offers an Aftab set. Images now on-line at his site. "...because the star came with its own bow..."
It is not my guess. See for yourself the blow-up of Queen Alexandra's insignia worn on the bottom of the sash, posted by Markus earlier in another thread. I've seen it, thanks. The problem I've never seen another Aftab-star with a blow-up (though true: I've never seen before any Aftab-badge with pendants either, and I cannot imagine any other way for Alexandra to get this thin-ribbon bow except from the set of insignias given to her by the Shah). From Andreas Thies' latest auction catalog, a beautiful set of Aftab order up for auction. Thanks Mitya and 922F for noting this auction. Andreas Thies' Aftab order back with hallmarks. Appears to have St. Petersburg city hallmark and maker initials ES. Seems like most of the Persian orders with jewels were made in Russia. Any one else have any ideas on which maker ES was? 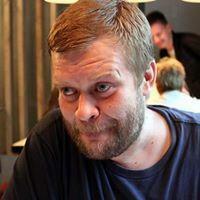 Thanks Mitya for the snap shots! For that sort of period probably Edward Schramm who was a Faberge workman. First Russian Aftab I have seen. I thought they were mostly French made.